THE National Leagues begin in earnest this weekend with both Antrim’s hurlers and footballers opening with tricky home games at Corrigan Park over the next two days. THE hurler’s open their National Hurling League 2A campaign against familiar foes, Kerry this afternoon (Saturday). The Saffrons were demoted from 1B last year so will be aiming for a quick return and a good start is imperative against the Kingdom. Antrim fans will need no reminder what happened when the sides met in last year’s Joe McDonagh Cup. 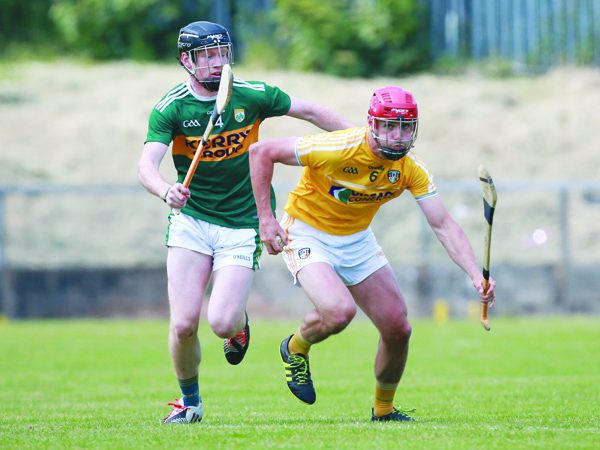 Leading by 10 points after 20 minutes, they were eyeing a spot in the final, but things were to unravel badly as Kerry dominated for the rest of the game and were to go on and win by four – leaving Antrim in a relegation playoff they were to win against Kildare. The fact that Kerry had nothing but pride to play for that day made the defeat even harder to take, but this weekend there is the chance to put things right and begin the season on a positive note. “Kerry Westmeath, Carlow and ourselves – there’s not a puck of the ball between us and it’s been that way for a number of years,” said Neal Peden who has taken the managerial reins this year. “Kerry will be coming to Corrigan off the back of the win last year in Cushendall. They’re a strong, physical team and have a scoring power. Shane Conway scored nine points for his university last week so they have the scorers. It will be a different Antrim team to the one that took on the Munster county last year with the Cushendall contingent concentrating on their club’s upcoming All-Ireland semi-final, while Joe Maskey is also on club duty with St Enda’s heading to the Intermediate Football final on February 9. Their absences have opened the door for some new faces to come in and stake their claim during the Keogh Cup that ended with a defeat on penalties in the final against Westmeath last weekend. Cushendun’s Conor McHugh has slotted in well at wing-back, while Ronan Molloy and Phelim Duffin flanked the experienced John ‘Rocky’ Dillon in the full-back line. In attack, James McNaughton continues to blossom into a top-class forward with Keelan Molloy, Nigel Elliott and Ciaran Clarke adding pace. Home advantage counted for little last summer, so the notion that the long journey north will hinder Kerry becomes obsolete for this weekend. Antrim simply have to start well and unlike last year, maintain a consistent level throughout each game going if they are to give themselves a shot at reaching the final. “The home games are vital and the expectation is always greater when you’re at home no matter who you’re playing,” Peden accepts. “That doesn’t always work out. Even when we have been down in Carlow or in Navan against Meath, these teams step up their intensity and we have to get there. Antrim’s footballers could hardly have wished for a tougher opening game as they host Ulster neighbours and promotion favourites, Derry tomorrow (Sunday). The Saffrons also harbour ambitions of escaping from the basement division, but they take on the two sides that were relegated from Division Three last season in their first two games. Sunday’s clash against the Oak Leafers is followed by a trip to Wexford Park to face to the Model County. If they lose those two games, Antrim would already be facing an uphill battle and manager, Lenny Harbinson is under no illusions about the size of the task. “It is going to be one of our toughest games, but they all have their challenges,” stated Harbinson. “In relation to Derry, the bookies have made them favourites to be promoted and the bookies aren’t too often wrong. It isn’t that long ago that Derry were playing in a Division One final. The remarkable success of the Slaughtneil club in recent years has often hampered Derry’s campaign with several key players unavailable until the later stages of the League. It is something Harbinson can relate to as he faces into the new season without the services of a host of key players. When they took on Leitrim for their League opener last January, Antrim used 19 players as they made a winning start at Corrigan Park. Of those 19 players, 10 will be unavailable for a variety of reasons this weekend. While goalkeeper, Chris Kerr has retired from inter-county action, seasoned campaigners Conor Murray and Kevin O’Boyle are sidelined through injury, while Ballymena’s Paddy McAleer has taken a year out. Additionally, Portglenone’s Niall McKeever and Cargin’s James Laverty have not rejoined the panel. With so many established players unavailable, Harbinson used the pre-season McKenna Cup to blood a host of new players with the likes of Eoghan McCabe (St Gall’s), Patrick Finnegan (St Brigid’s), Fintan Burke (Creggan), Patrick McCormack (Moneyglass) and Owen McKeown (Lámh Dhearg) all getting their first taste of senior inter-county football. Last Sunday’s All-Ireland Club IFC semi-final win for Naomh Éanna also means that Peter and Kristian Healy, Odhran Eastwood and Eoin Nagle won’t be available until the round four fixture against London at Corrigan Park at the earliest. “St Enda’s had a fantastic win and there is a great opportunity for them to kick on and win an Intermediate All-Ireland,” said Harbinson.